**thanks to Jellystone Mammoth Cave for hosting my family for a stay. I was not compensated for this post. This is my experience and opinion. Others may have a different experience or view. Have you ever taken your family to a Jellystone Park campground? Before my recent stay, I had only visited one on a youth group campout...some years ago. 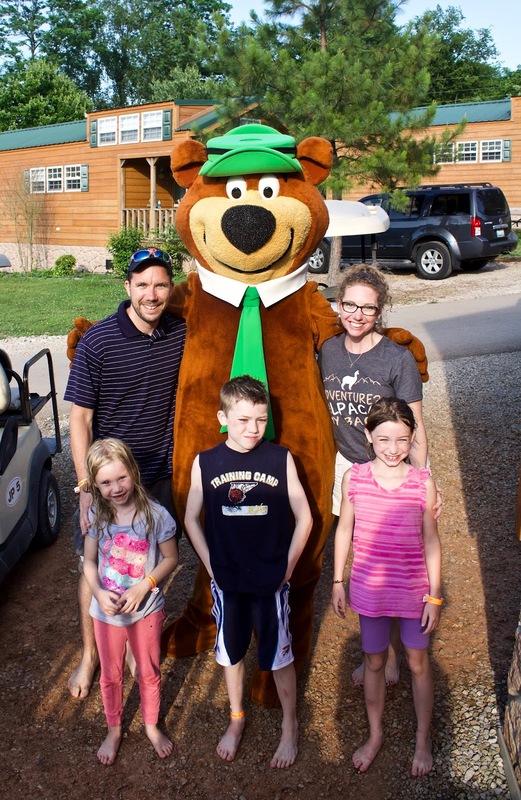 My family was recently invited to stay at Jellystone Mammoth Cave so we decided to head down there for a Father's Day weekend celebration. (Cool gift, huh?) We didn't know exactly what to expect but we were so looking forward to our time there. We don't own any camping gear...ok...maybe a couple sleeping bags. Does that count? But if your'e like us, you're in luck! 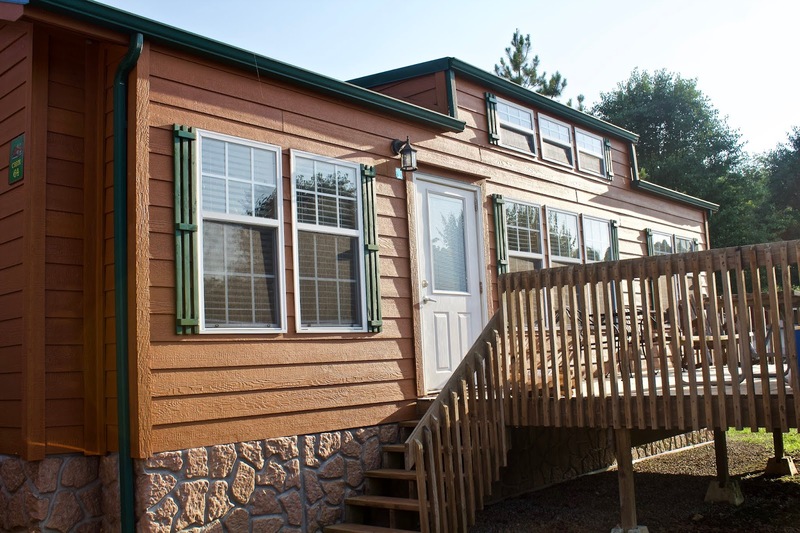 Jellystone Mammoth Cave has quite a few cabins available to rent at different sizes and price points. We stayed in the Cindy Bear Cottage and found it to be quite comfortable. We had 2 bedrooms, 1 with a Queen sized bed and 1 with twin bunk beds and another Queen bed. We also had heat and central air, a full kitchen, a full bath, a gas fireplace, a tv with limited cable channels, a deck with a picnic table, and a fire pit at the bottom of the porch stairs. We literally couldn't have asked for anything more and loved our stay there. 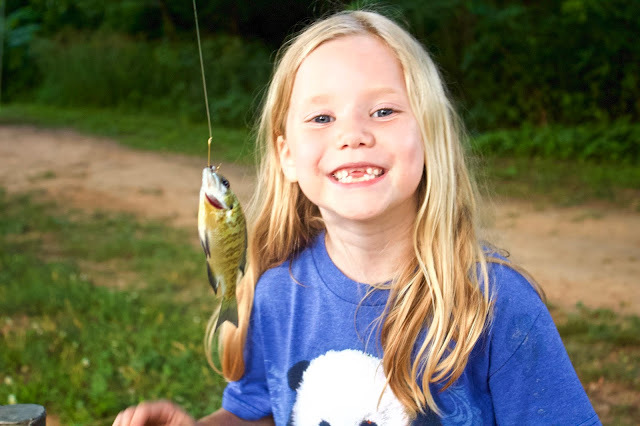 Our first night there, the kiddos were begging to go fishing. 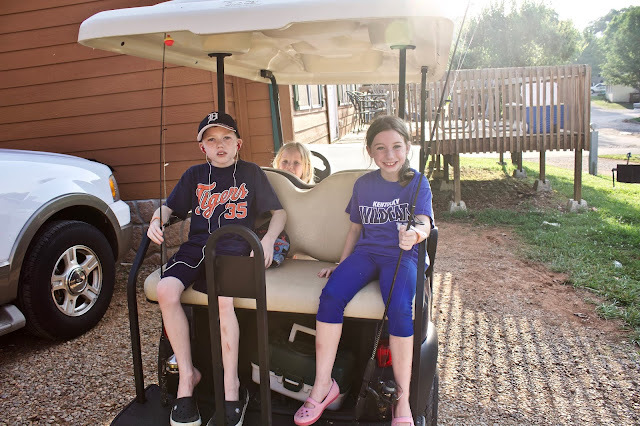 We hopped in our golf cart and headed down to the pond with our fishing gear after a quick stop to the Ranger's Station for worms. 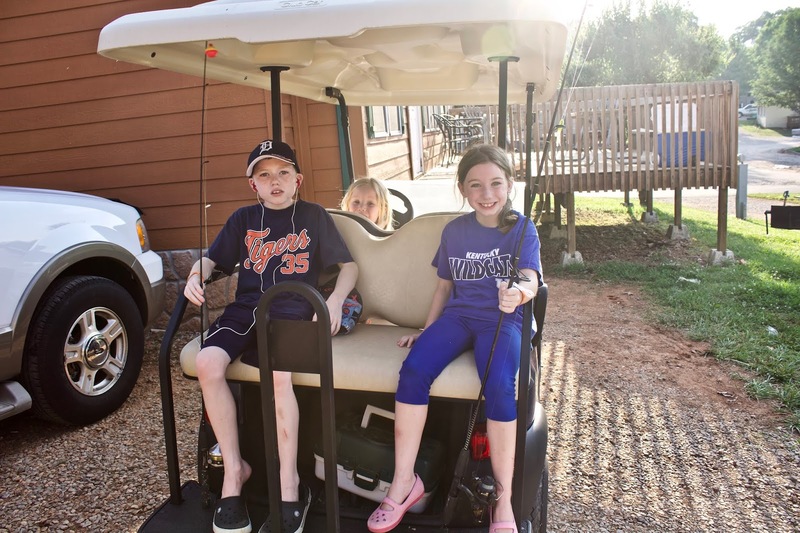 As a quick side note: When you reserve your campsite or cabin, that is the perfect time to also reserve your golf cart. The grounds are huge and there are hills. I saw a few families who wished they had reserved one when they arrived and found there were none left available. This is where we came to fish. It was peaceful and we could hear the music playing from the pool/ splash pad just on the other side of the pond. 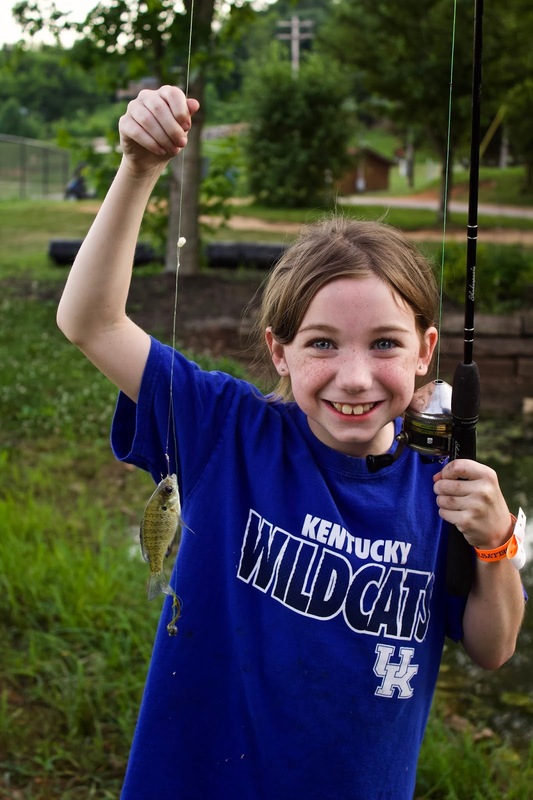 It was a perfect night for fishing fun. 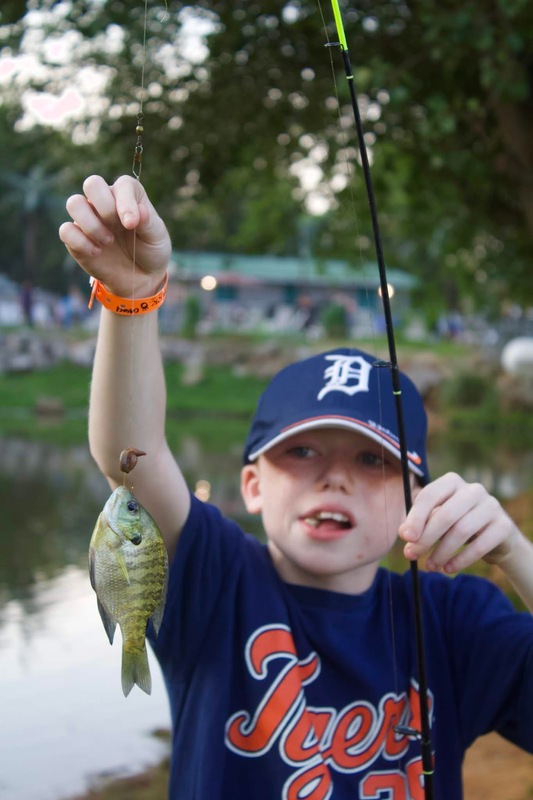 After we finished up with our fishing, we headed over to the Pavillion for movie night. The movie playing our first night there was Trolls. Can you see those tired eyes watching the movie? My kiddos were so tired from driving and fun that they all voted to head back to the cabin early. 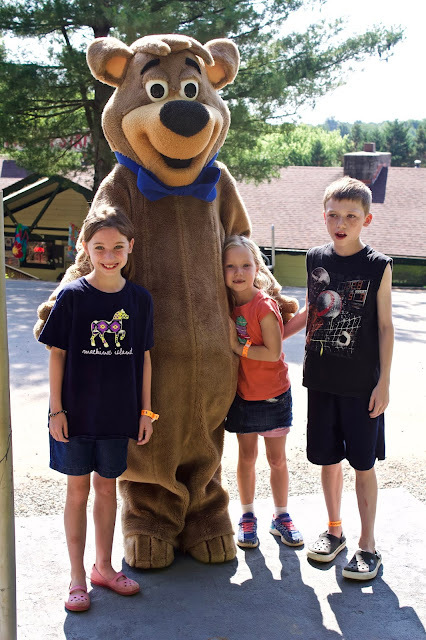 Our second day at Jellystone took us off the grounds for a bit of family fun locally. It was a super hot day and all I kept hearing while we were out was "Once we get back to our cabin, let's get in our bathing suits and go swimming". New to Jellystone Mammoth Cave, is this wonderful little lake and the Wibit. If you're a guest there, this is free for you to use, lifejackets are also free (and required). 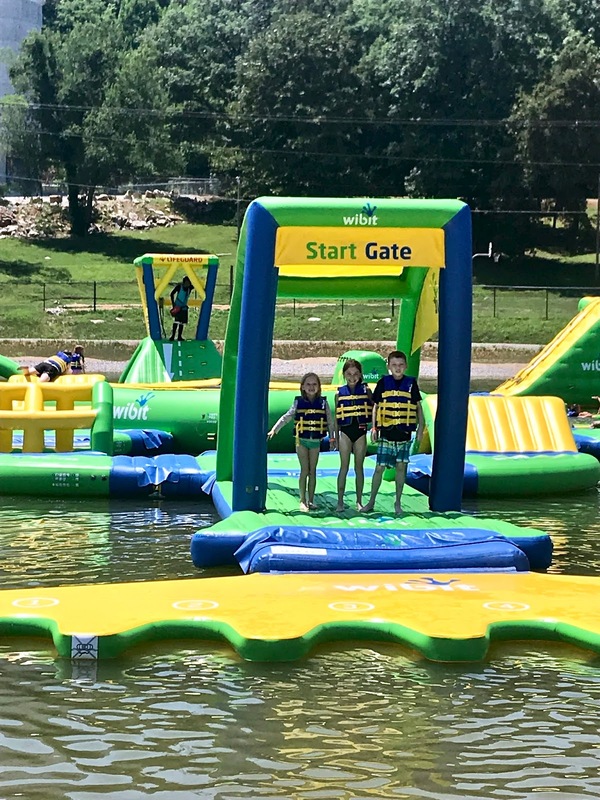 The water is shallow enough that you can walk out to the Wibit to get on and then enjoy the obstacle course(s) from there. There are different levels of difficulty to try that are clearly marked. My kiddos played on there a bit and while they did, I found a giant tube to float in. All the "Yes" to relaxation while the kiddos play. This area is now open to the public for a paid entry fee. It may make it a bit busier than when we were there but there are lifeguards all around the lake to keep people safe. And while it wasn't opened yet while we were visiting, the plan is to have a restaurant down there as well as easy parking access for the camper's golf carts. Just on the other side of the trail from the lake, is the water slide. My boy really had to work up his nerve to try this out, but once he did he didn't want to stop. He went on and on about how fun it was and how glad he was that he was brave enough to try it. He also told me about a couple tricky turns that could flip you from going feet first to head first if you're not careful but said that was part of the excitement. As I watched him, I noticed that there was a line of kiddos all taking turns again and again. The slide had life guards at the top and bottom who would switch jobs in shifts to keep them alert to what they were in charge of. Right behind the Ranger's Station, we found the arcade. My kiddos love a good arcade and winning prizes. This one was pretty fun, reasonably priced, and had small toy and candy prizes that my kiddos were quite pleased with. I'm going to pause right here and talk about this next photo. 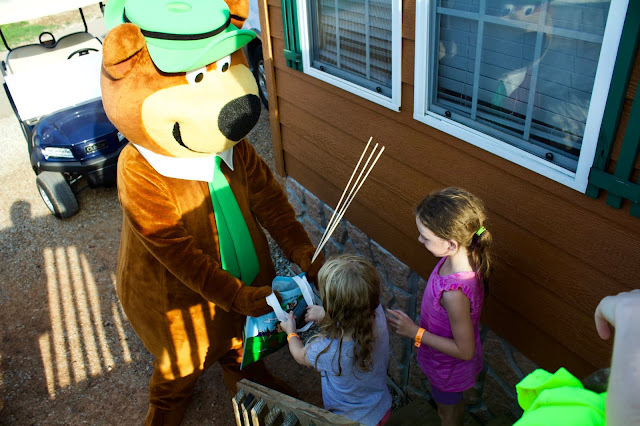 When you check in at Jellystone, you'll receive a list of scheduled activities going on throughout the day. Most of the activities are free, while some have an additional, yet reasonable fee to cover supply costs (like tie dye, for example). Look forward to meeting characters, doing arts and crafts, dance parties, movies, karaoke, contests, and more. There are things happening all day long and you can sign up for text alerts so you don't miss the things your family was looking forward to. After we found the arcade, my daughter and husband left my other 2 kiddos and me to head up to the pavilion for a Gummy Bear eating contest. Since it was Father's Day weekend, all the contests were themed to be the kids against the Dads. As you can see, my girl has metal. She beat her dad and was so proud of herself. 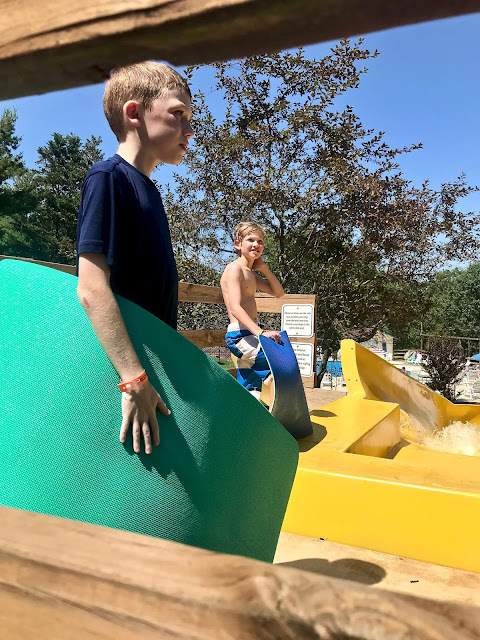 After the arcade, we drove ourselves over to the pool and splash pad. My girls had so much fun running around here while the hubster and my son headed over to the pool. Again, in the video below you can see them running around while the big sister was trying to spray the little sister with the water guns there. The laughing was unending. After we dried off and got ready to sit down to dinner, a very special guest came to our cabin. 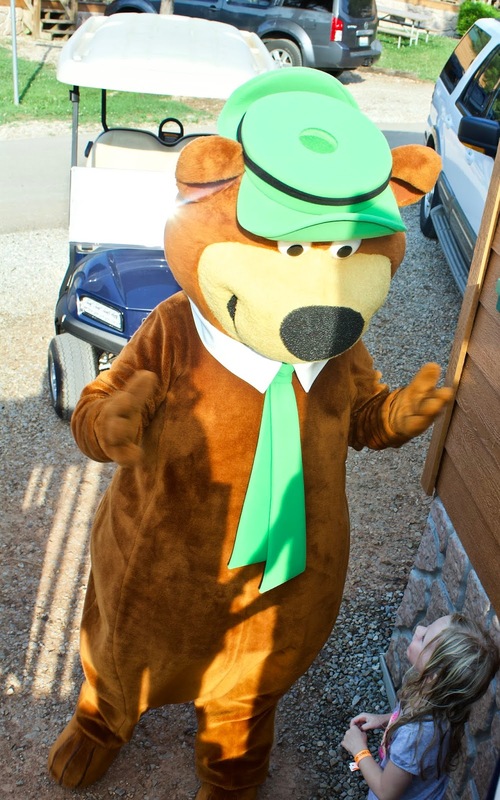 YOGI BEAR CAME OVER! I knew about the arrangement but my kiddos had no idea and they were so excited and surprised. 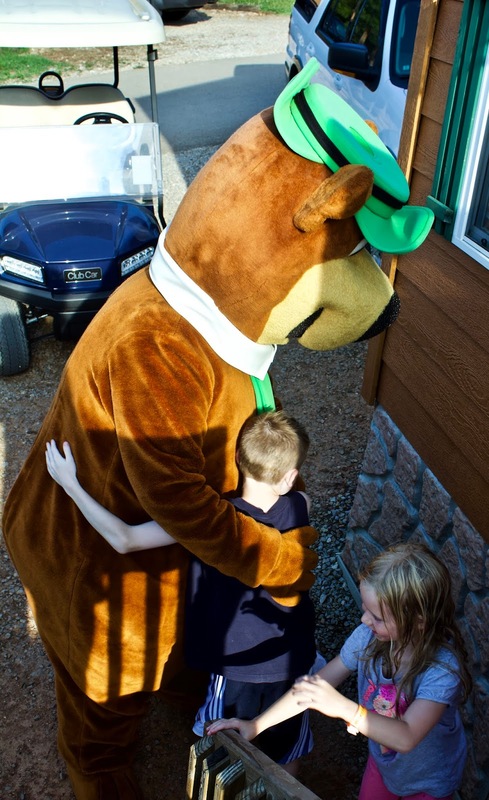 They took turns giving Yogi Bear hugs and Yogi gave them a s'mores kit. The best thing about this? Anyone can set up a visit like this. When you make your reservation or after you arrive, you can ask about scheduling a special birthday visit and which character you would like to stop by. The smiles and memories made are definitely worth it. 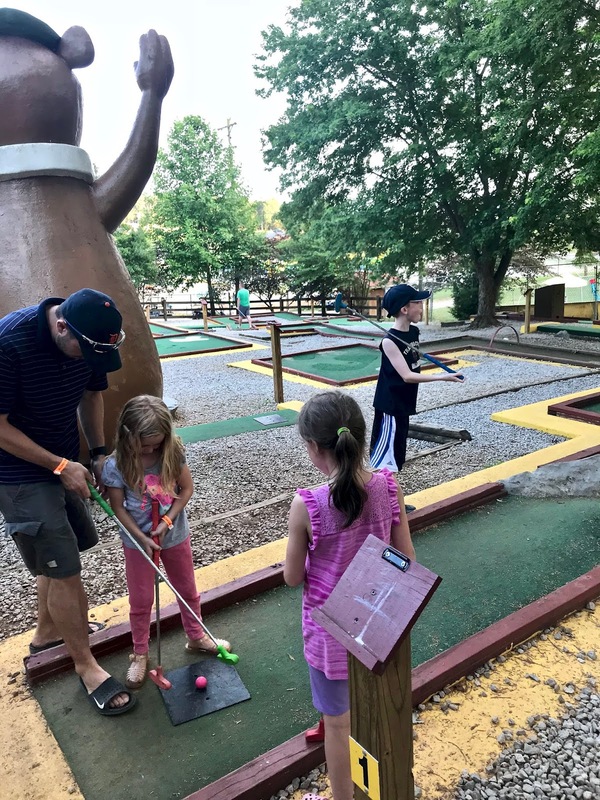 Don't forget to spend an evening playing put-put golf! We headed over after dinner when the foot traffic was a bit lighter and the temperature was a bit cooler. There are 20 holes to play and had a great time. The smallest of us even got a hole in one! Just before we left on our last day, we drove over to the flagpole for the flag raising with Boo Boo Bear. There were so many kiddos waiting to see Boo Boo. After one of the kiddos there helped in leading us in the Pledge of Allegiance, all the kids lined up for their photo opportunity with Boo Boo Bear. We had an absolute blast at Jellystone and my kids are begging to go back and spend a full week there next time. They've been telling all their friends about it and have convinced a couple of them to head down this summer. 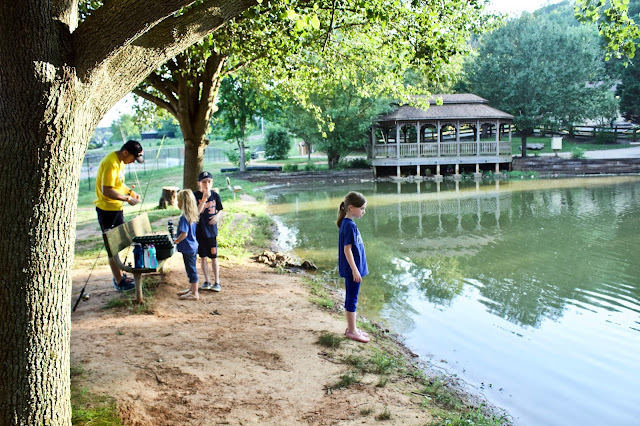 Within driving distance of the campground, there are many places to visit, eat, and shop. And don't forget about Mammoth Cave...or any of the many caves in the area. Below is a picture of the development that was going on right behind the new lake. From our cabin, I could also see work being done to expand the camping area further out. And none of it surprises me. 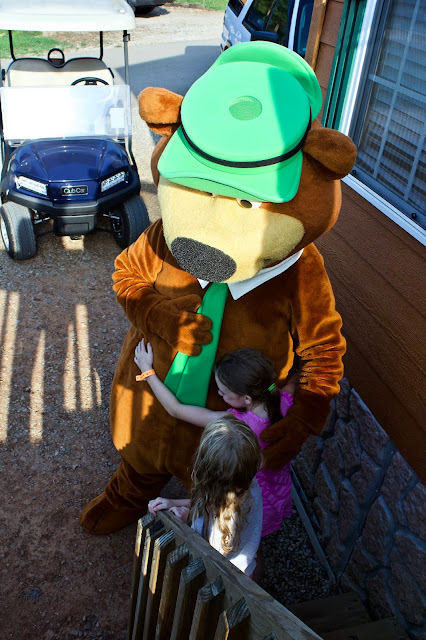 The staff at this campground are very friendly and professional. They "get" that your family vacation is important and they support that and show that it's important to them, too. I saw a pretty serious confrontation at the check-in desk over a golf cart (I'm telling you, reserve one at the same time as your campsite or cabin reservation) and the girl behind the counter was calm and extremely patient. And you know where there are a ton of kids things can get a bit crazy, right? The staff here makes sure to protect their having fun while keeping everyone safe at the same time. 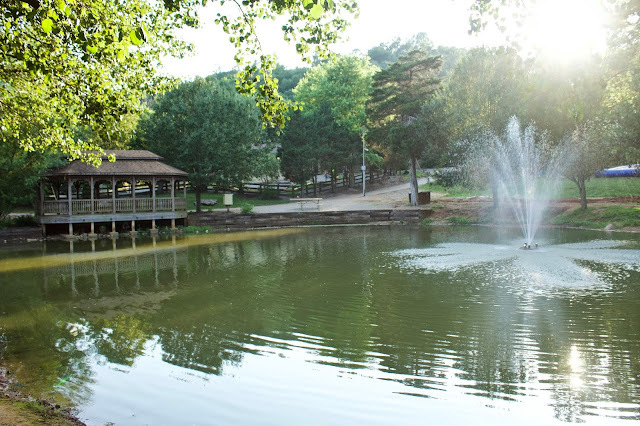 **Have you ever stayed at Jellystone Mammoth Cave? Tell me about your stay! !